Coffee Talk with Cathy Zielske - Write. Click. Scrapbook. Cathy Zielske is a graphic designer, author and blogger with strong ties to the scrapbooking industry. She is the former art director for Simple Scrapbooks magazine, where she oversaw the visual direction of all Simple publications and books. Cathy is currently developing and teaching online workshops to help scrapbookers write better and take what they've written and make it look fabulous. She's currently teaming with Big Picture Scrapbooking to offer her workshops, Designer Digitals to offer her original design templates, and Typepad to offer hilarious blog content. Cathy lives quite happily in St. Paul, Minn., with her husband, daughter and son, where she is a big fan of potato chips, Crowded House and stretch denim. WCS: 2009 was kind of a rough year for scrapbooking in many ways. Or was it? Now that the dust has settled, how are you feeling about 2009? CZ: 2009 WAS a bit freaky in many respects as far as scrapbooking goes, and it got very personal for me when I was laid off of my job at Simple Scrapbooks magazine. Not that it was a shocker that the magazine went under. You can only run so few ads for so long and survive in publishing. Still…it was a reminder that no job is safe in this day and age. On the flip side, for me…initially I had no idea what I would do. With all that's happened since then—teaching more classes at Big Picture Scrapbooking, creating products for Designer Digitals, designing eBooks for Ella Publishing—I've begun to see the lay off as a kick to my overall creative life in scrapbooking. This has been a really good thing for me. However, it is because of the great connections made during my years at Simple Scrapbooks that I've been able to continue pursuing a life inside of the scrapbooking industry. For that, I'm extremely grateful. WCS: Why did you decide to take the plunge into designing your own products for Designer Digitals? How has that experience changed your perspective about scrapbooking? CZ: Having seen the type of things Ali Edwards was doing—digital templates featuring great design and great concepts—I finally decided to take the plunge and learn more about digital design for scrapbooking. The result has been a complete recharge as far as my passion for story telling, design and photo taking goes. After working at the magazine for five years, admittedly, I was a bit burned out on the hobby. This foray into digital has reinvigorated me and reminded me what I love most: good design paired with great stories. Designing templates for Designer Digitals challenges me to create smart looks that encourage, not only good design, but good storytelling as well. 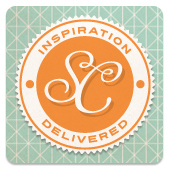 I've been a hybrid scrapbooker, combining digital elements with real life scrapbooking elements, since I started in 2001. It's been fun to see what I can make solely in the digi realm, as well as find ways to create hybrid concepts out of purely digital products. WCS: How have you changed as a scrapbooker since your early days? CZ: I'm less obsessed with it. I don't scrapbook every single day of my life, and believe me, in 2001, there were very few days when I didn't scrapbook. I think I have a very healthy outlook on saving stories. I know that I can't save it all, nor do I want to try. I want to enjoy the process when it inspires me from an organic place; that whole, "I have to write this down NOW" feeling. WCS: Last May, Stacy [Julian] ran a series on her personal blog called "When You Teach a Friend to Scrapbook." It was a great collection of tips and common sense advice. How about you? When you teach a friend to scrapbook, what do you tell her? CZ: I try to tell her it doesn't have to be an all or nothing venture, that you can save your stories in many different ways. Maybe it's just a Favorite Photos of the Year type of album, and that's it. Maybe it's a story book created at Shutterfly, or another online service. Maybe it's just a school days album. Maybe it's a hopes and dreams type of journal with no photos of any kind. Scrapbooking can be so many things. To pigeonhole it is to remove all the different possibilities. Even if it's just putting photos into an album with a few lines of description, I try to tell her that it can be that simple and still have incredible value. WCS: You're currently keeping yourself quite busy with Design Your Life at BPS, designing original product for Designer Digitals, designing at Ella Publishing Co., and blogging. Do you have any other plans up your sleeve for 2010? You know, 2010 is the year of flexing my creative muscles again, reminding myself of what I love—stories, photos and design—and finding ways to inspire others to feel that love, too. I'm hoping to teach more workshops, and very likely will be running my Me: the Abridged Version workshop again at Big Picture Scrapbooking. If I do nothing else than get a few more women to focus exclusively on telling their own unique stories, I'll feel like I accomplished something important in this industry. As you know, our stories really DO matter. That, and I'd love to lose some of my muffin top. WCS: Our theme this month at WCS is "Favorites." How about you tell us a few of yours? They can be current or all-time favorites. We're not picky. Feel free to elaborate or include visuals when applicable. Or add other favorites I didn't list. WCS: Favorite first stop on the internet each morning. WCS: Favorite thing to eat for dinner. CZ: Anything that has to be served in a bowl. WCS: Favorite album listened to in 2009. CZ: Owl City, Ocean Eyes. WCS: Favorite book read in 2009. CZ: The Middle Place by Kelly Corrigan. WCS: Favorite movie screened in 2009.